These Matches produce a flame even when wet. Great for camping or emergency preparedness. Can be used in a wet or dry environment. Pack includes 40 matches. In the event you need to build a fire, whether for outdoor cooking, warmth or to ward away wildlife, these emergency waterproof matches are designed work even when wet. 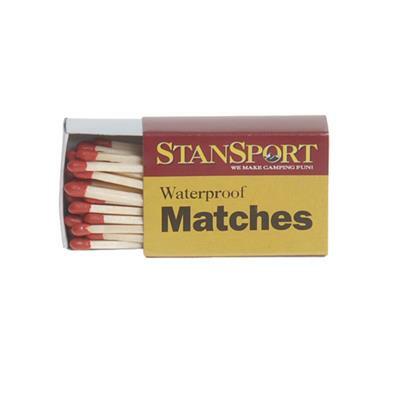 The match sticks are comprised of a unique blend of non-toxic chemicals that light even when wet. The matchbox striking surface is treated with a moisture resistant coating. A reliable source of fire is a survival necessity and can mean the difference between life or death in a survival situation. Emergency waterproof matches are a strategic addtion to your emergency kit, camping supplies or hiking pack. 1 box of 40 matches: 1.5" x 0.5" x 2.25"
Case (1000/Case):17.5" x 15" x 11"